If Thanksgiving isn’t a food holiday I don’t know what is. And I’m sure everyone is going to have plenty of food on their table this Thanksgiving so you don’t need any more recipes from me today. 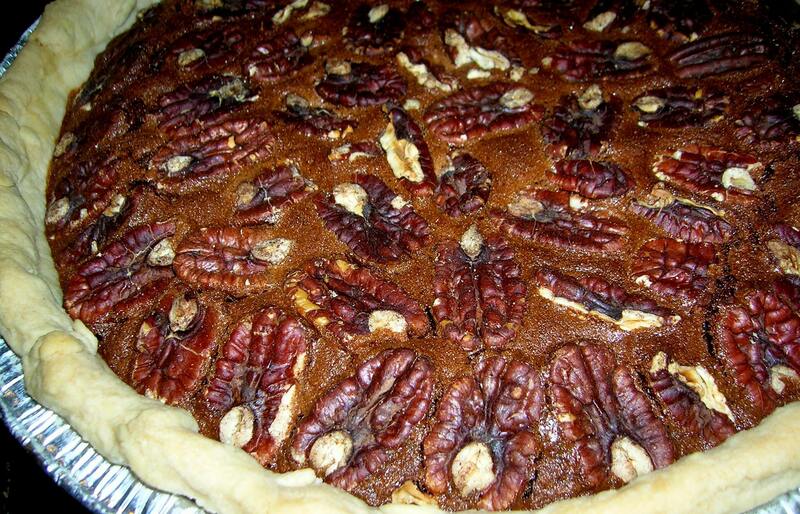 But, just in case you do, I have this great little simple recipe for Chocolate Pecan Pie. I first made this pie over 20 years ago and brought it to one of my families Christmas Eve dinners. I’ve been asked to make it every year since. It has become one of my families favorite and most asked for pie, second to my apple pie. The way my Aunt Mary was known for her Cassata cheese cake, I guess I’ll be known for this pie. For those of you who love pecan pie, the addition of chocolate to the pie filling makes this one a keeper. And it’s a great addition to the desert table along with the pumpkin and apple pie for Thanksgiving. Before I begin the recipe I just wanted to take some time to wish all my readers a very Happy Thanksgiving. This year as in the past I have plenty to be thankful for. Most of all, I’m thankful for my family, my faith, my health and my friends. With a combination of those blessings there is really nothing else more you need in this world. Buon Appetito! In a medium mixing bowl cut the shortening and salt into the flour by hand or with a pastry blender until it is the texture of cornmeal. Sprinkle 1 tablespoon of ice water over the mixture and mix just until the dough is moistened. Repeat by adding 3-4 tablespoons of water, one at a time, until all the dough is just moist. Do not over mix. Roll the dough into a ball and wrap in plastic wrap and place into the refrigerator until ready to use. Melt both the chocolates with the butter over a double boiler or melt in the microwave oven. To melt in the microwave, microwave on high for 30 seconds and check. Put in for another 30 seconds. Stir until the chocolate and butter are melted and combined. Set aside to slightly cool. In a large bowl beat the eggs and sugar together with the corn syrup. Add the melted butter and chocolate to the egg mixture along with the vanilla, coffee, and salt. Stir until smooth. On a floured surface, roll out the pastry to fit a 9 inch pie plate. Place the rolled out pastry into your pie plate. Trim off the edges to fit the plate and crimp the edges with your fingers to form the crust. Pour into your unbaked pie shell (ready made or home made) and arrange pecans on top. Bake in a pre-heated 425 degree oven for 5 minutes. Reduce the heat to 350 and bake another 30 to 40 minutes or until puffed and set. This entry was posted in Dessert and tagged Chocolate pecan pie, pecan pie, pie. Bookmark the permalink.